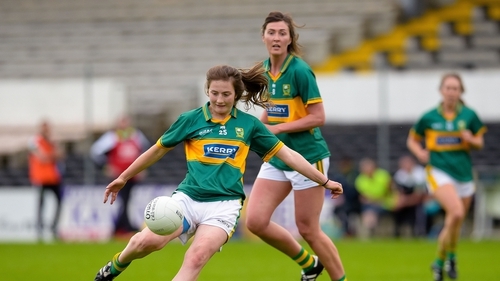 Less than two years after she sent ripples through Ladies Football with her stunning Kerry senior debut against Armagh in an All-Ireland quarter-final, Hannah O’Donoghue continues to grow into an outstanding talent. Last weekend she helped lead University of Limerick to a record 12th Gourmet Food Parlour O’Connor Cup with a player-of-the-match performance in the final against UCD, but now her attention turn back to her inter-county duties. Kerry host Cavan in their Lidl National Football League Division 2 clash at John Mitchels tomorrow (SAT), and the Beaufort clubwoman wants to keep the good times rolling. "We were delighted to win the O’Connor Cup, over the moon. All of the hard work paid off in the end," said O’Donoghue. "It’s back to Kerry now and we are making great improvements there. The main thing at the moment is to get back to Division 1 and then we will look towards the championship after that." A win on Saturday would be a huge boost for Kerry and O’Donoghue’s hopes of promotion back to the top flight after last year’s disastrous campaign ended in six defeats and one draw from seven games. Draws against Clare and Waterford in their first two games of this year’s Division 2 were not the return that they perhaps deserved, but victory over Laois and an extra game to play following the postponement of their recent clash with Wexford means they are still in the hunt. "I wouldn’t know much about Cavan really. They have got some good results so they will be a tough team to beat. "We have three games played and I would have played the most part of all of them. "We haven’t lost a game but obviously there are improvements to be made. We are taking each game at a time and trying to get the second win." The 18-year-old is in her first year of Engineering at UL and looks forward to switching to Biomedical Engineering down the line. "I played with Cork City last year but I am not playing with them anymore. It was too hard to travel between Limerick, Cork and Kerry. It is just not really possible for me at the moment," said O’Donoghue. "Soccer and football are very different because the soccer is very tactical. Skills-wise, I don’t think you can take much from one to the other. "Fitness is actually completely different as well. There is a lot of running in soccer, and you have to cover more ground. Football might be a bit more intense though. "I just love playing football. Even if I have a spare hour or anything, I would go for a kickabout with Fiadhna Tagney and the girls. Just any chance I get really I would go kicking a ball. "There would be a lot of gym work. I try to get there as often as possible. But I am probably more of a player to focus on the skills, with the kicking and that side of things." O’Donoghue was inspired to play football by her dad Sean, while her uncle Vincent O’Donoghue was an accomplished footballer too. Mary Jo Curran and Nora Hallissey were O’Donoghue’s other idols, and they trained her on the way up, while Bernie Breen and Patrice Dennehy were other players she looked up to. But winning back-to-back All-Irelands at U-16 level under Graham Shine built the confidence towards an awesome debut at Nowlan Park in Kilkenny, when O’Donoghue shot 1-4 on 12 August 2017. "I don’t think anybody expected me to score that much," said O’Donoghue. "Every game I just try and enjoy it because if you enjoy the football you are going to play better anyway. "I just try to enjoy it as much as I can."